We are a friendly amateur orchestra which rehearses at the Leatherhead Institute from 8 pm until 10 pm every Wednesday evening during term. 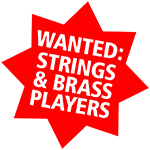 We cater mostly for adult players but welcome younger ones, including those with little or no orchestral experience. The music we play is from the standard classical repertoire. Leatherhead Orchestra - celebrating our 60th Anniversary, December 2014. There are no specific entry standards or auditions, however you will probably need to have played for a couple of years, be playing reasonably in tune and be able to practise at home. At the end of each term we play through the rehearsed programme in front of families and guests. This is followed by a supper to round off the evening. We make no charge for attending the concert. If you would like to join us contact the membership secretary (email address below) or just come along. Our term subscription is £53.00*, which of course includes light refreshments. At the moment we need string players, both violin and viola.